For those born in the Year of the Dog, the year of the Sheep 2015 is all about teamwork. This is a year where you will get your strength from your personal relationships, but at the same time you need to take care of yourself and continue to grow as a person. Chinese Dog sign and sheep sign are compatible Chinese signs and because of that those born in the year of the Dog should fare well in 2015. The theme of this year is co-operation and teamwork. There could be great things in store for the Dog zodiac sign this year, but achieving them will require working with others to achieve your mutual goals. Do not be in haste, as the effects of Mercury Retrograde 2015 are bound to influence your life. The theme of teamwork is especially important in your romantic life, forecast the 2015 Chinese dog zodiac predictions. If you are in an existing relationship, this is the time to lean on your partner. Building a life together involves co-operation and partnership. You will realize just how important those things are and your relationship should become stronger than ever because of your new perspective. If you are single, you may find that friendship is the best foundation for romance and the type of partnership you crave. Working with others will help the Chinese dog animal sign in career in 2015, the Year of the Wood Ram. Maybe it means taking some extra slack around the office or letting a co-worker do the same if you feel overwhelmed or it might need joining a new team or project. In whatever form this teamwork presents itself, it will help change your perspective and may present new opportunities for advancement or enrichment in job and business. If you are in a relationship, your finances will be very entwined with your partner’s this year. There will be big decisions to make, but they need to be joint ones, otherwise resentment and complications will arise. If you are single, you may still find that your finances are connected to someone else’s, maybe a family member and because of that financial decisions need to be made very carefully this year. For the Dog astrology sign, 2015 is a year of co-operation and teamwork. This applies to every aspect of your life: career, financial, and personal. You need to make sure to retain your independence while getting strength from others. You should attempt to push your personal boundaries. 2015 could be a year of great personal growth if you let it be. 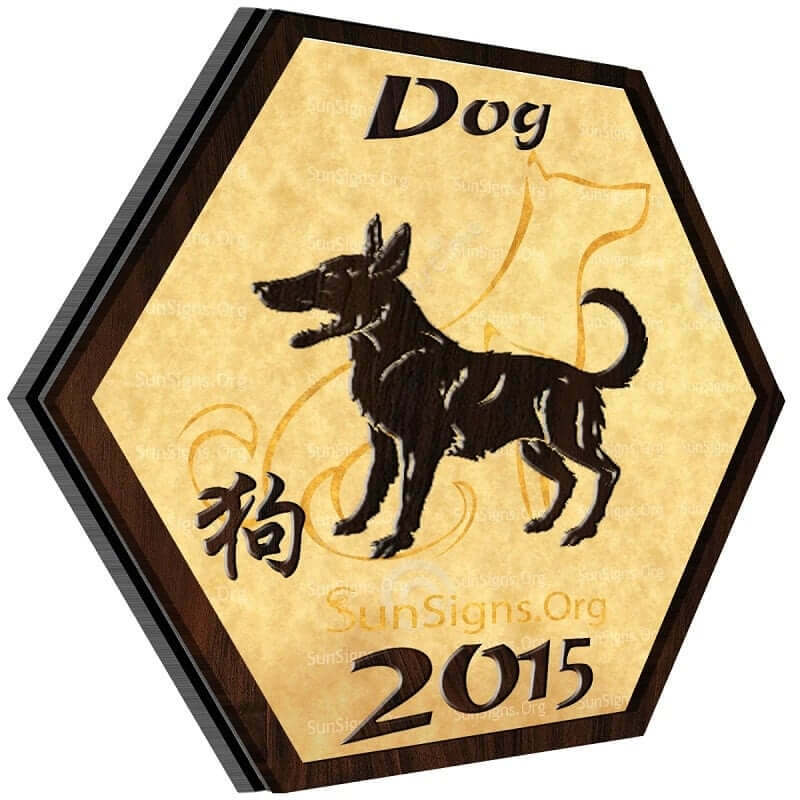 The Chinese Dog Astrology forecasts for 2015 advice you to take care of your physical health. You need to be in top shape in order to achieve your goals in the Chinese New year. Do not let fatigue spoil your future. Opt for alternative healing therapies that can give you relaxation and relief from stress. People born in the year of the Dog tend to be very social by nature. You are happiest surrounded by your friends and loved ones. In 2015, you’ll come to realize exactly how much you value those closest to you and the blessings that they bring into your life. You have a few demons to overcome, because you value your relationships so much, you can be prone to jealousy and insecurity. At times, you may struggle to define yourself outside of your relationships. You may even want to speak to someone and get help establishing your own independence. Chinese horoscope 2015 suggests that a good way to establish your independence is to establish hobbies and interests of your own. This is a good time to try something new. Meeting new people and stepping outside of comfort zone will do you a lot of good and open up new possibilities for you. As a rule, you like staying close to home, however 2015 is a good time to get out of your comfort zone. Dogs, going to new places, meeting new people and exploring new customs is a good way for you to grow as a person. It is a perfect time to take a trip to a new place and have an exciting adventure.